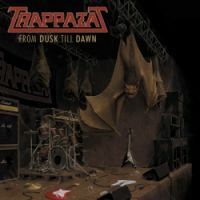 Back in 1989 a band was formed - they were called Trappazat and they recorded eight songs. They also played two gigs. Many years forward and the singer has resolved to release this save it be left to rot. His story is interesting, sad and in places fun. But what of the music? There’s no room for sentimentality and I have to say that largely the vocals feel a little forced. The opener, “From Dusk Till Dawn” (sic) is rough and dated with way too much squeezed in but is then followed by something better. “1 a.m. DOA” sees a rolling bass charge and a really good instrumental middle section before “Can’t Stand The Heat” takes it down a notch or two. To be honest that just serves to highlight the vocal deficiencies. “Breakout” kicks with a 1980 or 81 Maiden style before the vocals but they don’t hang around long. This charges along before an introspective section and then a full-on instrumental finish. The vocals do appear briefly again and much as it pains to keep saying it they let the thing down. And so it continues. It’s generally tight musically in that wild early 80s way and on “Possessed” the vocal finally comes down from its attempts at high notes. It’s better but obscures some great music. This restraint comes through on “First Born” too and it’s a song that manages to go somewhere. This is quite past its sell by date but I know that isn’t probably an issue for them. Musically it has some fun parts but the vocals need work and sound irksome with twenty odd years of dust on them.